Options on stocks and indices are asymmetric in nature in the sense that the buyer and the seller have different risk-return payoffs. 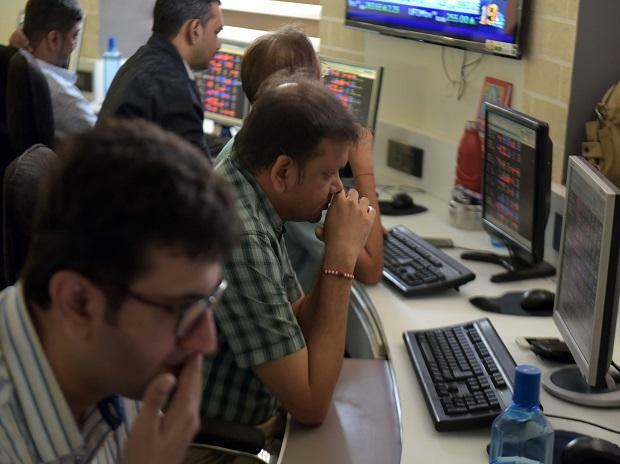 While the buyer of the option has limited risk and unlimited returns potential, the seller of the option has limited return potential but unlimited risk. It is this asymmetric nature of options that makes them amenable to permutations and combinations so that very granular and specific strategies can be created. One such strategy is a protective put. In a protective put you buy futures and limit your downside risk by attaching a put option. However, on the up side, once the cost of the put option is covered, profits are unlimited. That is why it is always best to begin our understanding of a protective put strategy by understanding call options. A call option is a right to buy a stock or an index without the obligation to buy. That means you will pay the premium to get the right without the obligation. That premium is your option price and represents the maximum loss that you will incur in the transaction. For example, if you buy a Reliance 1200 March Call at a premium of Rs.25, then your break even is Rs.1225. Above the price of Rs.1225, your profits are unlimited. On the downside, your loss can never be more than Rs.25, which is the premium paid. We can replicate the call option with a protective put strategy, where we buy futures and buy a lower put option. Let us look at a protective put approach in detail. A protective put is also a bullish strategy but it comes with in-built insurance. The problem with buying naked call options (as explained above) is that you end up paying a huge premium and more often than not it is difficult to recover the premium amount. An alternate strategy could be to design a protective put where you buy futures and protect it by buying a lower put option. In the Reliance example, if you can buy Reliance Futures at Rs.1200 and protect yourself with an 1160 put option at Rs.15, then your maximum risk is Rs.15 only and your breakeven point is lower at Rs.1215. The advantage of preferring a protective put over a naked call option is that you have flexibility on put strike selection. How does the protective put option payoff look like? In our illustration, the trader has bought 1 lot of Reliance Futures at a price of Rs.1200 and tried to hedge with an 1160 put option at a premium of Rs.15. Here is how the pay off table will look. The last shaded column calculates the net payoff of the protective put option. Here are some key inferences that we can draw. a) The maximum loss of this protective strategy is Rs.55. This is the total of the Rs.15 paid as put premium and the Rs.40 gap between your futures buy price and the put strike. This is obviously not acceptable and hence your strike price should be much closer to your futures price to reduce the maximum loss. b) The breakeven point for the protective put strategy is Rs.1215 which is the futures buy price plus the premium on put option. Above this level breakeven level of Rs.1215, the profits will be unlimited c) There is an important point to remember. 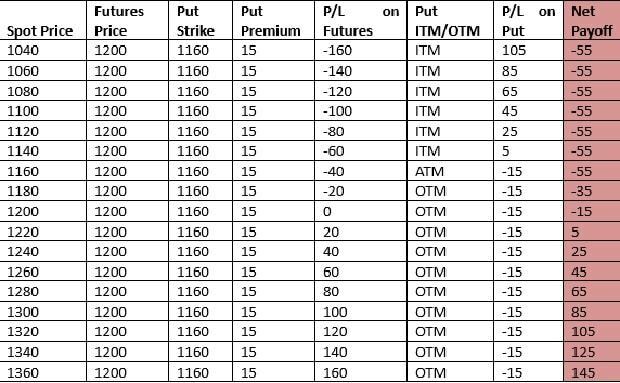 When the price of Reliance goes above Rs.1160, the put option becomes out-of-the-money (OTM). When an option becomes OTM, it only has time value and that time value can erode quite rapidly. As a trader, you need to be cautious about this aspect. In a nutshell, the protective put is a good method of limiting your downside risk at the same time maintaining a bullish position on the stock. Your expected price movement should be strong enough to cover the additional cost of put premium. Disclaimer: The above opinion is that of Ms. Sneha Seth (Derivatives Analyst - Angel Broking) & is for reference only.